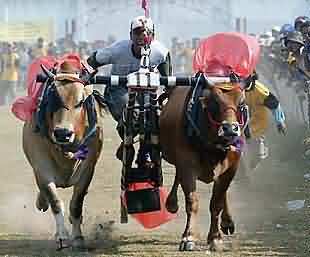 Karapan Sapi is a prestigious event for Madurese people, a very popular sport and spectacle, in Madura, Indonesia. The event was firstt popularized by Prince Katandur from Sapudi Island in 13th century as an expression of joy for the abundant harvest. Today, Karapan Sapi is regularly held at least twice a month after the harvest time during September to October starting at 9 AM in Sampang, Bangkalan, and Pamekasan. The finals are held in Pamekasan. This event is an outstanding-event-party for Madurese, regarding this event, the bull becomes a very valuable investment out of gold and money. Thus, the owner will more concern to make their bull winning in this race than anything else during the event since the bull’s ownera will be socially uplifted when their bulls win the trophy. At Karapan Sapi, the race track are typically about 100 meters long and it takes about ten to fifteen seconds to finish. The bulls race in pairs. There is also a standing wooden cart that put in those bull’s back, a place for the jockey to ride away the bull and controlling their speed, named Keleles. Before the race, each team will show up their bulls in parade accompanied by Madura’s traditional instrument named Saronen. The bull’s owner usually hire a shaman to keep the bull from the attack spell from their enemies. However, bull is not an animal type for racing activities and are not classified as fast runner animals. To solve it, the owners train the bulls up to twice or three times a week before participating in the event. This training usually held around 3 PM before dawn. It is said that a pair of healthy and strong bulls will cost Rp. 4 millions per pair (about USD 400) just for their food and other treatments. Moreover, they are also consuming some traditional herb and dozens of chicken(about 80) eggs per day for the strength and stamina. To make the bulls running as fast as they can, their tails are tied with a belt full of sharp nails, it was also given the chili and ginger. The jockey’s whip is also added with nails. It seems sadistic here, but that is the way, the culture. The more they get hurt, the more of the bull will run faster. Ouch.